How'd you like to have an amplifier named after you? William Doherty did just that when he invented a special amplifier in the 1930s. That's why he's in our Microwave Hall of Fame! The Doherty amplifier originally was intended for radio transmitters. Below we can see that the life of the radio engineer in the 1930s wasn't as easy as it is today. If someone can tell us why the tubes are blowing out when the music gets loud, we'd love to know! The Doherty amplifier offers improved efficiency compared to balanced amplifiers, when output power is backed off from saturation. Doherty amplifiers are typically used in communications (radios, not radars). The heart of the Doherty amplifier is the Doherty combiner, shown below. Update 24 February 2017: the schematic below was previously incorrect (but is correct now), the output was on the peaking amplifier which would have caused signal cancellation due to how the input is fed. We apologize for any confusion this may have caused. Thanks to Martin for pointing this out! The Doherty amplifier power-combines two (and recently, more) amplifiers, one is called the "carrier" amplifier while the second is called the "peaking" amplifier. In many Doherty amplifiers (more alternatives will be discussed further down), the two amplifiers are biased differently, the carrier amp is at a normal Class AB (provides gain at any power level) or Class B, while the peaking amplifier is at Class C which only conducts at half of the cycle. The beauty of the Doherty amplifier is improved power-added efficiency, compared to a balanced amplifier, at backed off power levels. If you will always operate at saturated power (like in many radars) you have no business using the Doherty. The Doherty amplifier pair works as follows: on the input the signal is split using a quadrature coupler (not necessarily an equal split), such as a Lange or branchline hybrid (branchline is shown in our schematic). The input behaves the same as a balanced amplifier, and has the same feature where mismatched amplifiers will have their reflection coefficients reduced if the reflection coefficients are equal in amplitude and phase, the reflected waves end up in the load terminating the isolated port of the coupler. The output of the Doherty pair is where life gets interesting. The two signals are out of phase by 90 degrees, but by the addition of a quarter-wave transmission line of the peaking amplifier, they are brought back into phase and reactively combined. At this point the two signals in parallel create a Z0/2 impedance. This is stepped up to Z0 by a quarter-wave transformer. In a fifty ohm system the transformer would be 35.35 ohms. However, the amplifiers are operating nonlinearly, so the output combiner is more complicated. During operation, the response of one amplifier actively load-pulls the other, as they are not isolated like they would be in a Wilkinson power divider, for example. To design a Doherty amplifier, you are going to need to perform nonlinear analyses. There are several ways to make the two amplifiers behave differently. As previously mentioned, you can set them in different bias classes. You could operate them in the same class, but use an adaptive biasing scheme to turn on the peaking amplifier when it is needed. You could use unequal-sized devices. Or you could use an unequal-split power divider on the input. Here is BLF888E RF power transistor pair assembled onto a Doherty eval board realized in microstrip on a Rogers' soft board material. 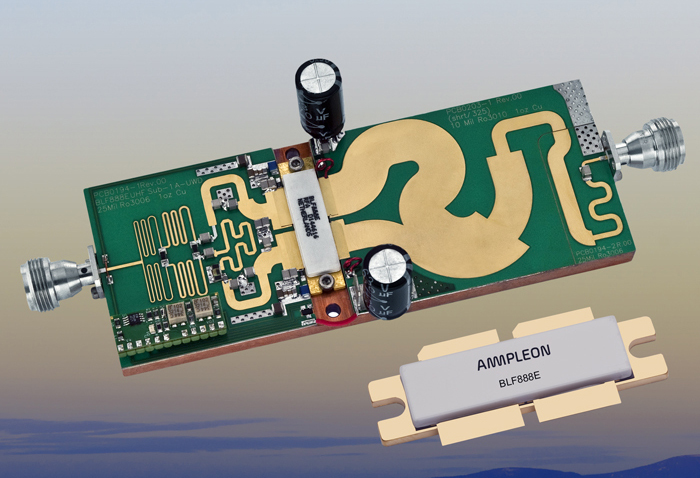 The image and transistors are available from Ampleon. This is a real work of art, why do you think RF circuit boards are called artwork? In this case, the transistors are the same size and biased at the same point. The Doherty action is due to the unequal power divider on the input. It is realized with a Wilkinson divider, where one output is followed by a squiggly high impedance, quarter-wavelength impedance transformer. The ratio of power (you can find this on the web) is 1:1.5. On the output, the fat lines are impedance transformers to match to the transistors' low impedance outputs. The upper path has an additional quarter-wave length to put the transistors back in phase. The carrier amplifier is on top and the peaking amplifier is on the bottom; the peaking amplifier has lower input power due to the high-impedance line in front of it. That amplifier pair is capable of 750 watts peak! W. H. Doherty, “A New High Efficiency Power Amplifier for Modulated Waves,” Proceedings of the IRE, Vol. 24, pp. 1163 – 1182, 1936. A. Z. Markos, P. Colantonio, F. Giannini, R. Giofrè, M. Imbimbo, G. Kompa, "A 6W Uneven Doherty Power Amplifier in GaN Technology", Proceedings of the 2nd European Microwave Integrated Circuits Conference, October 2007, Munich, Germany.